Tired and stressed from long hours of driving? RoadPro has a better way to relax your tired muscles and ease back pain -- 12-Volt Heat-Massage Seats are an affordable way to have heated seating and massages right inside your truck. 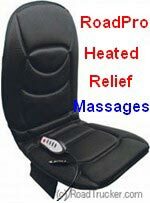 RoadPro Heated Relief Massaging Sets and Seatbacks are made of cushion that tends to stay cool in the summer and warm in the winter. So it is a dual purpose seat for professional truckers like you. Feeling cold but no time to stop and do some warm ups? 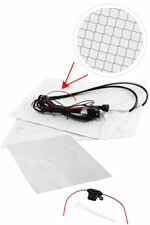 Crimestopper Heated Seat kit quickly heats up so you can feel warm in just about 2 minutes. See item below. The Crimestopper Dual Electronic Temp Heated Seat kit uses a carbon fiber backrest & seat cushion to provide relaxing heat while driving. Versatile pads can be trimmed to customer fit on any standard seat. 1-2 Min QUICK Heat-up Time! Get relief from your driving day with RoadPro's 12 Volt Heated Massaging Seatback Cushion. Heat relaxes tired muscle while the massaging motors provide a soothing vibration massage. Made of soft superior cushion for added comfort during extended periods of travel. Available in suede and black colors that looks wonderful for truck interior.